How many of us out there took piano lessons as children? Most of us out there probably dabbled in some kind of music as kids, even if we didn’t stick with it. Though there’s the extra-curricular option of picking up drums, guitar or piano, at least in school we probably had some exposure to recorders and xylophones if nothing else! Still, not all of us stick with our musical endeavors—but those that do over the long-term end up developing incredible talent. 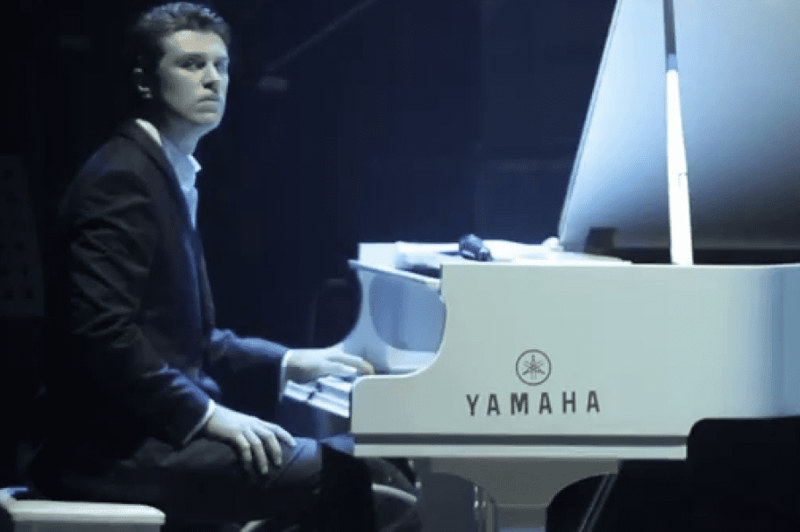 As a result, there’s plenty of hidden musical talent out there that we may not know about. This story is just one example of it. Although we’ve all probably seen a street performer or two at some point in our lives, some are definitely better than others. 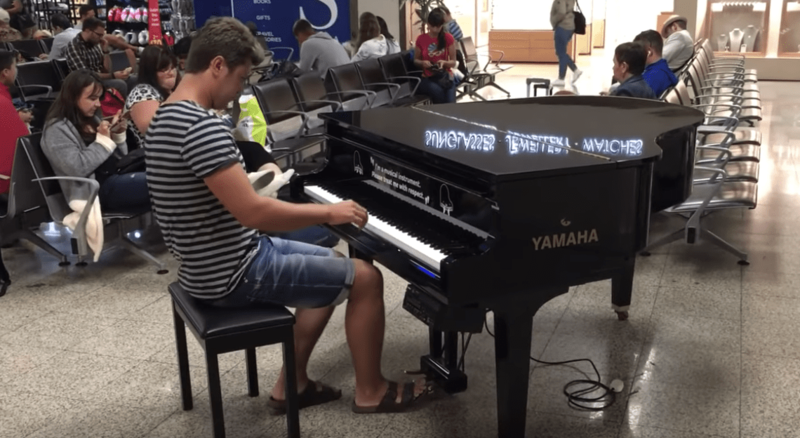 One particularly talented street performance has been making the rounds on the internet recently. 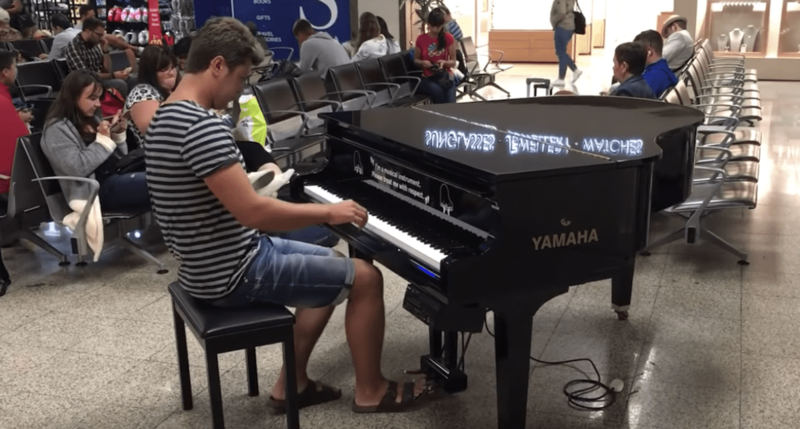 In the video, Ukranian pianist Evgeny Khmara plays a stunning song on a Yamaha piano in front of a bunch of passengers waiting at the Luqa airport on the island of Malta. Although many of us (and of the people in the video) have probably not heard of Khmara, the performance had everyone captivated all the same. At the end of it, everyone burst out into applause! As it turns out, this is not the only video of Khmara doing incredible things on the keys that has surfaced around the web. As a matter of fact, the video of him performing in Malta is just one of many in a social media campaign that he and his team devised! To raise awareness for his music, Khamara started a social media campaign called piano around the world. As the name suggests, the campaign is made up of videos of Khmara playing in highly public international places around the world—mostly airports and train stations, for example. In another video, Khmara plays another medley of songs in a London train station. Just like the other video, strangers gather around to watch his incredible dexterity and precision! Despite people needing to get to their trains or wherever else they were going, he still attracts a crowd and is able to perform a number of different songs to applause from strangers. Unlike the first video, this clip shows his range as he plays fast songs along with slower emotional songs. Still, Khmara’s travels around the world still weren’t over by this point. 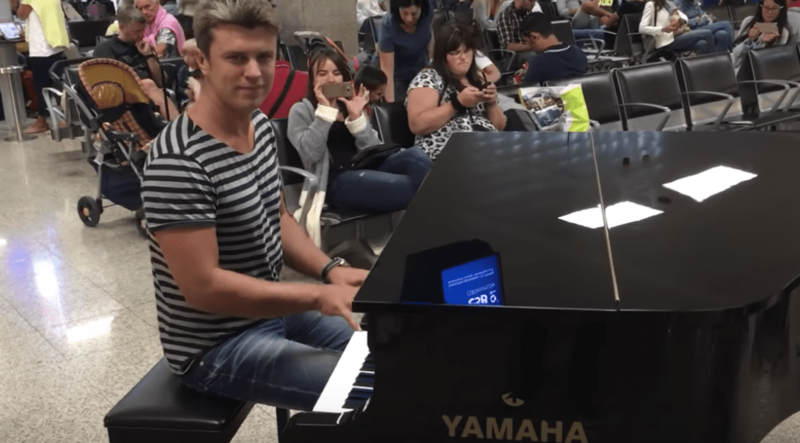 In another clip, he can be seen performing at an airport in the Ukraine! Of all the videos, the last one may have the most engaged audience of all! Though we didn’t mention it yet, Khmara is a composer as well as a player. In this final clip, the audience truly gets to hear just how much emotion he pours into his music. The chords and arpeggios are sweeping and he is in complete control over every shift in the emotion. While he’s certainly a master at playing his own compositions, though, he doesn’t shy away from a well-placed cover from time to time either. For proof of that, just check out his second-most popular video on YouTube: a piano cover of the score of Pirates of the Caribbean! While the tune is certainly recognizable, Khmara adds in plenty of his own flourishes and makes it his own. Beyond the main melody, he adds some pedal work in to make some parts lighter and others much heavier. At other points, he adds in so many extra notes that it boggles the mind! As always, the final performance gets a hearty round of applause. Though he still has plenty of other material on the internet, we’ll leave it for you to discover. For those who were fans of these videos, Khmara also has his own personal website with more information about shows and albums. Though we might not know about him in America, he has already competed on “Ukraine’s Got Talent” as well as the Ukranian edition of “The X Factor.” After hearing his music, we’re confident that his talent is sure to spread all over the world. Congratulations to Khmara on all his viral success and we wish him all the best of luck in the future!